To many people, the word Columbine will conjure up images of the tragic high school massacre, which took place in Columbine, Colorado, in 1999. 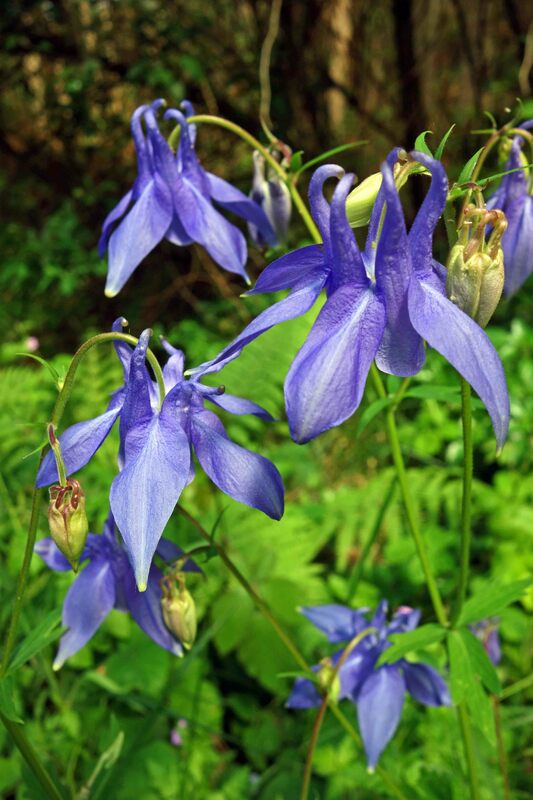 Columbine is however, a rather attractive perennial flower, with the latin name, Aquilegia vulgaris L. This plant has been cultivated for centuries by gardeners and a variety of different hybrids of various colours have been produced. The wild or native plant is widespread in the British Isles (and Europe) but is probably only common is certain locations, such as calcium-rich soils. All of the photographs in this blog were taken of plants in Galicia, Spain. What is striking about these flowers, is that every petal carries its own elongated nectar spur; this flower is pollinated by bumblebees in the genus Bombus, and the flowers themselves are highly specialised for bumblebee pollination (1). There are however, some bees who have learnt to cheat! They perforate the spurs of the flowers near their base to gain the nectar, without carrying out the commensurate activity of pollination. In other words, they can’t be bothered to go in the front door – up the flower and past the stamens – they just steal the nectar via the back-door! This ‘robbing’ behaviour was first noted and recorded a long time ago, by the German naturalist Christian Konrad Sprengel (1750 – 1816) in his delightfully named book, The Secret of Nature in the Form and Fertilization of Flowers Discovered. The relationship between the plants and insects is a complex one, with each side trying to gain an advantage (an ‘evolutionary arms race’). The plants want to be cross-pollinated, so produce nectar to attract bees to carry out that task in response to a reward. They form special relationships with some of their bee clients, rewarding those with the right-sized tongues to reach into the floral nectaries. But when robbers come along and bore a hole through the flowers to get at the nectar without expending energy on doing it the right way – which results in fertilisation of the flower – this is thought to change the behaviour of legitimate pollinators and also to affect the pollination and fertilization success of flowering plants (2). I guess the other bees think, ‘hey, if you can get away with day-light robbery, perhaps I should do so as well’! One way in which the plant can ‘fight back’ against the nectar robbers, is to produce toxins to dissuade them from puncturing the flowers. 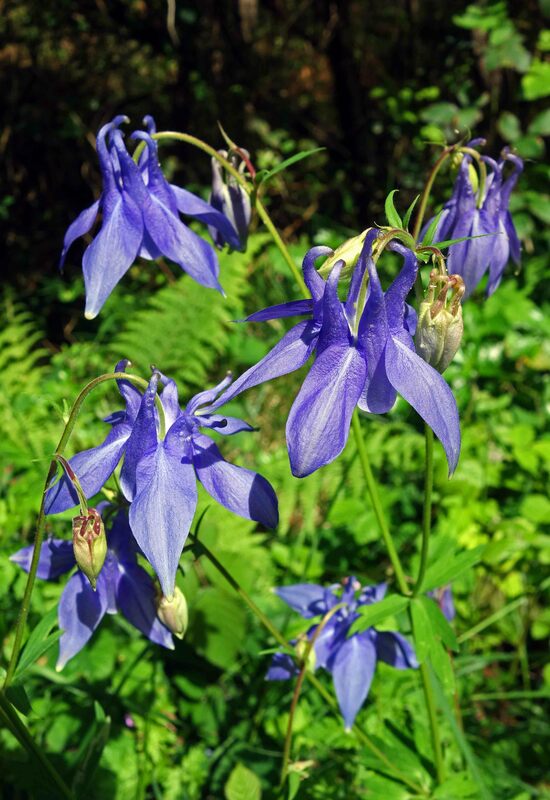 The flowering columbine plant is poisonous to animals since it contains a toxin called cyanogenetic glycoside (a cyanogen). Perhaps this is produced to prevent insects from eating the flowers? Do the robber bees just spit it out when they drill their holes? The shape of the flower has resulted in a number of imaginative names such as Granny’s nightcap and Granny’s bonnet. Only readers of a certain age will be familiar with such garments! So if you see any of these distinctive blue flowers this spring/summer, keep an eye out for bumblebees and look to see whether any of them are ‘cheating’ by drilling a hole in the nectar spur (the hooked spurs at the top of the flower). If they are, report them to the nectar police! 1. Denisow, Bożena & Sebastian Antoń (2012). 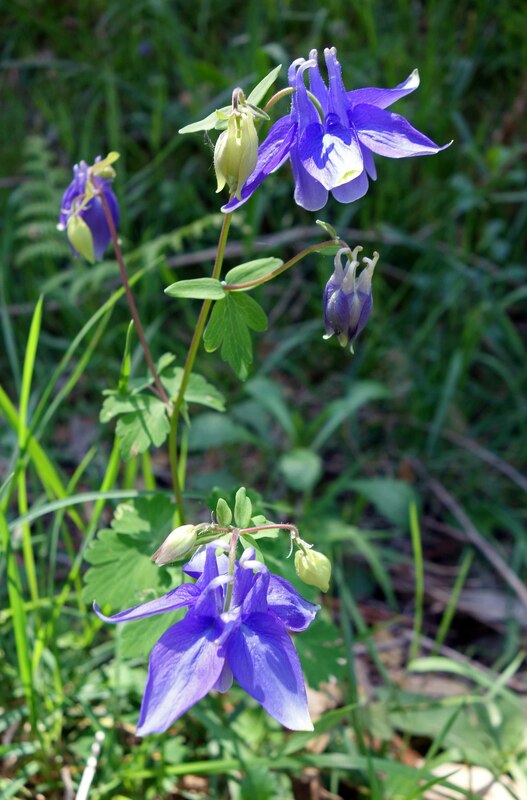 Flowering, nectar secretion, pollen shed and insect foraging on Aquilegia vulgaris L.(Ranunculaceae). Acta Agrobotanica 65 , 37-44. 2. Irwin, Rebecca E., and Alison K. Brody (1999). Nectar-robbing bumble bees reduce the fitness of Ipomopsis aggregata (Polemoniaceae).” Ecology 80.5, 1703-1712. Thanks Ray, very informative and interesting piece. I will link to it next time I post a columbine photo. Ray Cannon's nature notes Bumblebees stole Granny’s bonnet!